Please utilize the chance to reserve your seats by early bird tickets on or before April 6th. 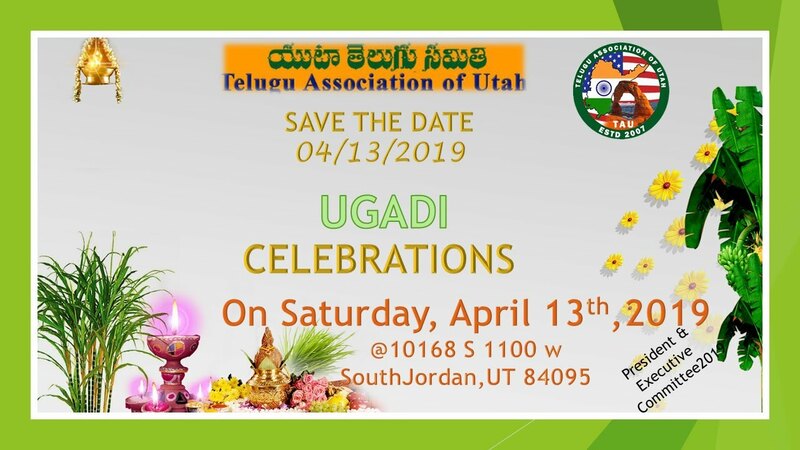 Ugadi 2019 Celebrations Please click on above link to reserve your seats!!! Please use the below link to register your participation. Ugadi Sambaralu 2018 on March 24th 2018. 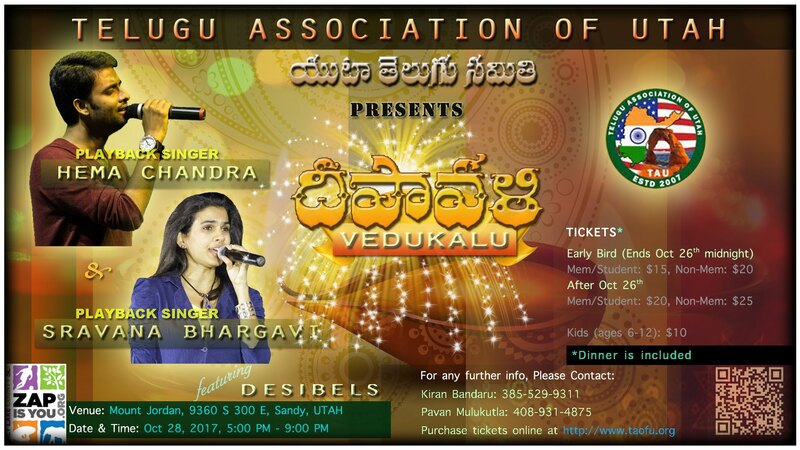 Telugu Association of Utah thanks everyone for making Ugadi 2017 event successful !! 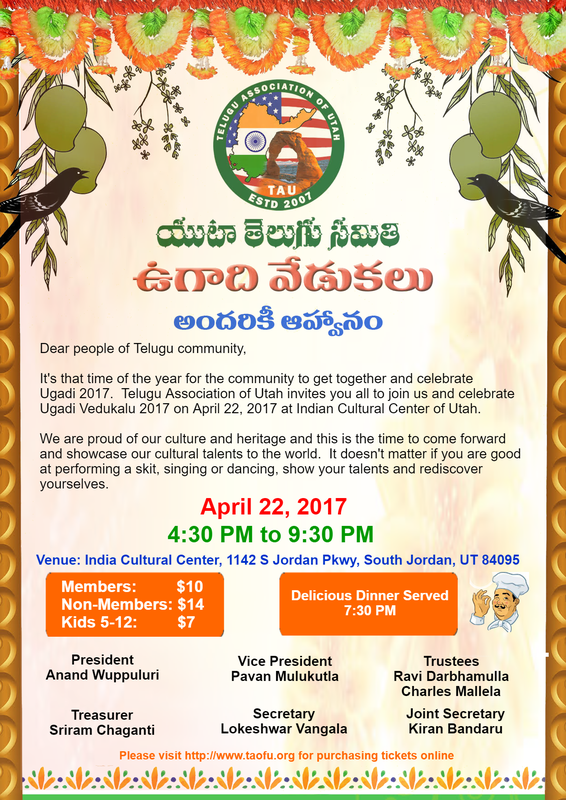 Telugu Association of Utah welcomes everyone to Ugadi 2017 event. 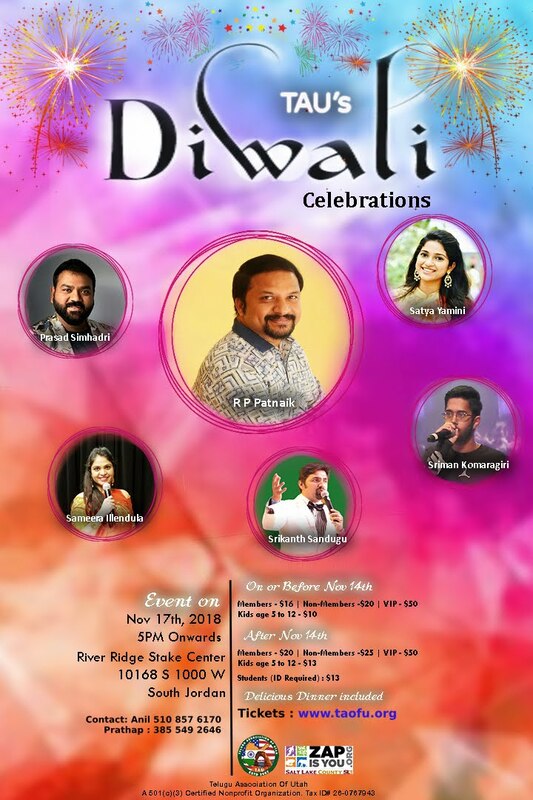 Thank you everyone for making Diwali event grand success. Online ticket sales are closed. Sorry for the inconvenience, please buy at the counters. Thank you for all your support. Thank you Utah! 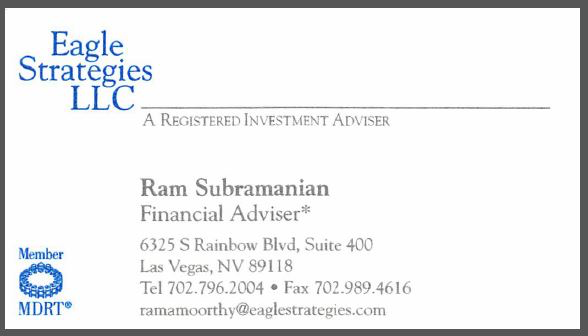 for making Ugadi 2016 a great success!! Support TAU by donating membership fee and save on event tickets? TAU Board 2016 would like to announce Ugadi Celebrations for Durmukhi naama samvatsaram. The celebration will be on April 16th, 2016! TAU Board 2015 would like to thank all those paid members for showing their support to TAU by attending the GBM today (12/27/15). It would also like to congratulate the new executive members (below) of TAU Board 2016. TAU would like to THANK you all the Sponsors, Volunteers, Desibels and the Community for making "Deepavali Musical Event 2015" a GRAND SUCCESS. TAU would like to thank and appreciate each and everybody including Participants, Sponsors, Volunteers and Attendees for making TAU Ugadi 2015 event a grand success. Keep checking this space for event photos and any videos. 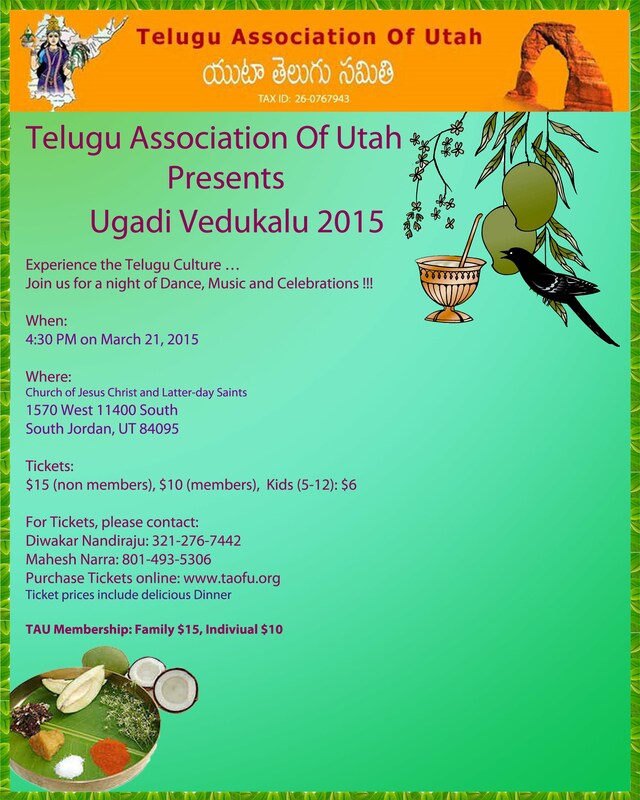 Like to Volunteer for Ugadi? Like to Participate in the Event? Thanks to each and everyone that could make it to the GBM today 12/28/15 in the snow. We like to invite all the TAU members to annual General Body Meeting. Note: The meeting is only open for TAU active members. This holiday give something that means something. Blood is often referred as liquid love and its donation is one of the purest forms of service. So what better way than saving lives with something which is available in plenty and replenish-able, yet so precious that it cannot be man-made? 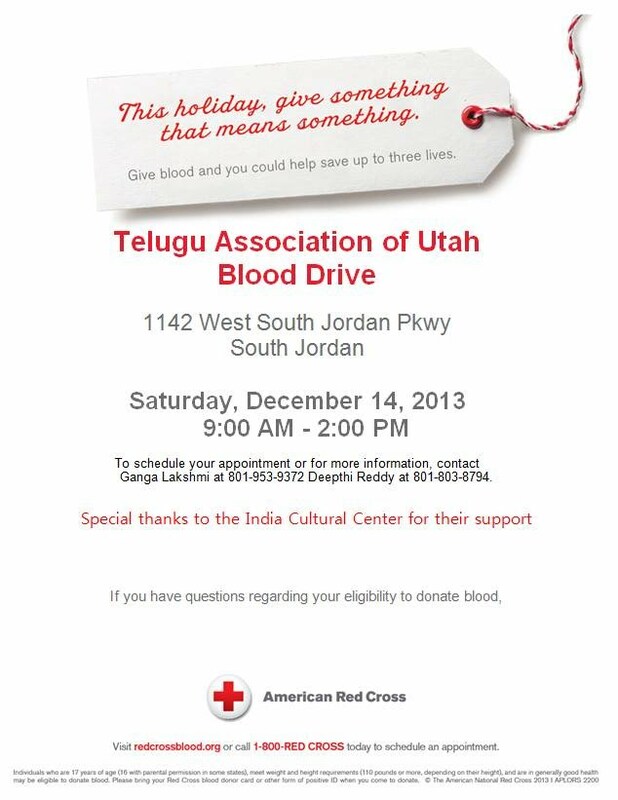 TAU is organizing Blood Drive in association with American Red Cross at ICC on Saturday 11/14/2013 from 9AM till 2PM. TAU thanks India Cultural Center for providing the venue free of charge. ICC is also providing free breakfast item to all the donors. Special thanks to: India Cultural Center for providing the venue and free breakfast to all donors free of charge. 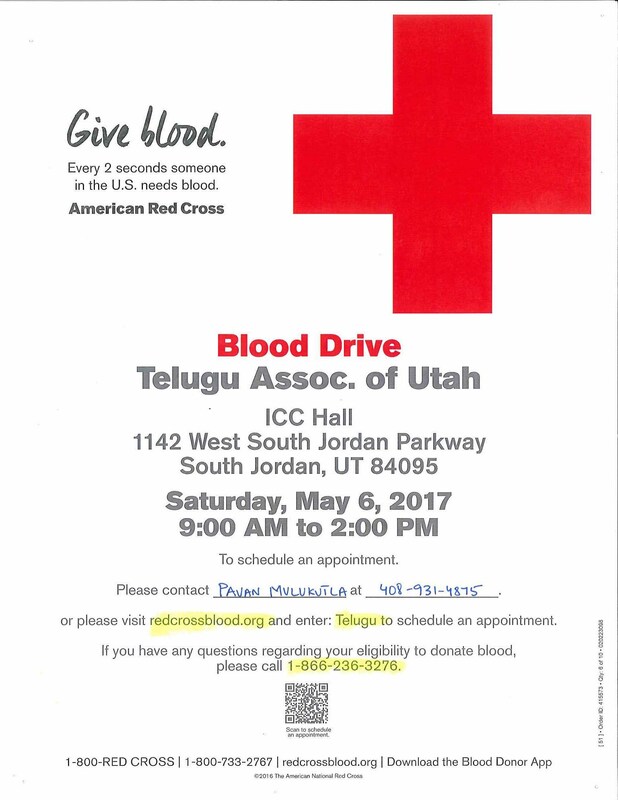 Please contact Deepthi Reddy (801-803-8794) or Ganga Golakoti (801-953-9372) or email charity@taofu.org to schedule an appointment to donate blood. Annadaanam (Food cooking and serve) under ‘Project Annapoorna’ would be conducted on 12/21/2013 to serve the homeless at Dinner at Vinny's 437 W 200 S Salt Lake City. 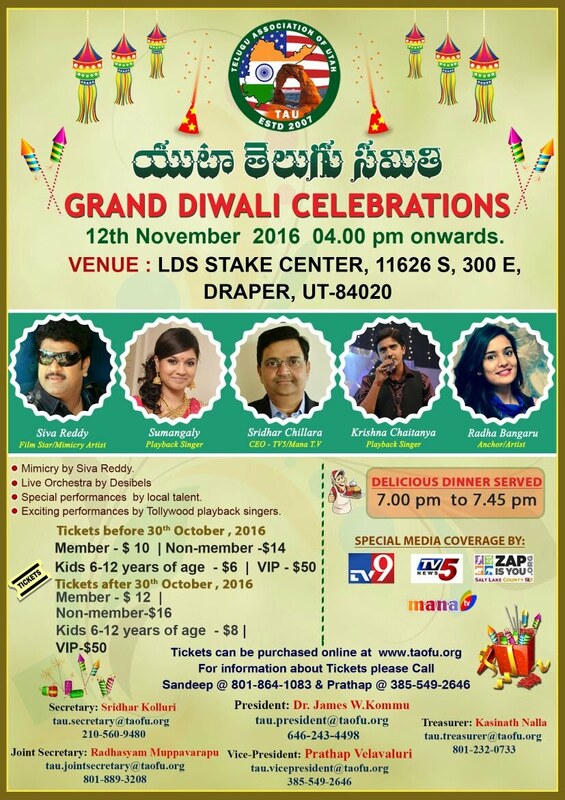 Telugu Association of Utah is seeking volunteers to give 2 to 3 hours of their time for this noble activity. There is NO cost involved in hosting/participating in this activity. 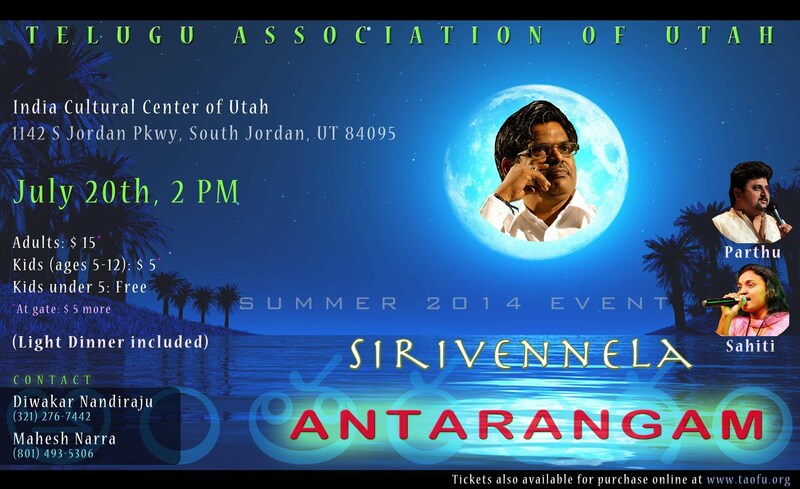 Telugu Association of Utah will bear all costs. 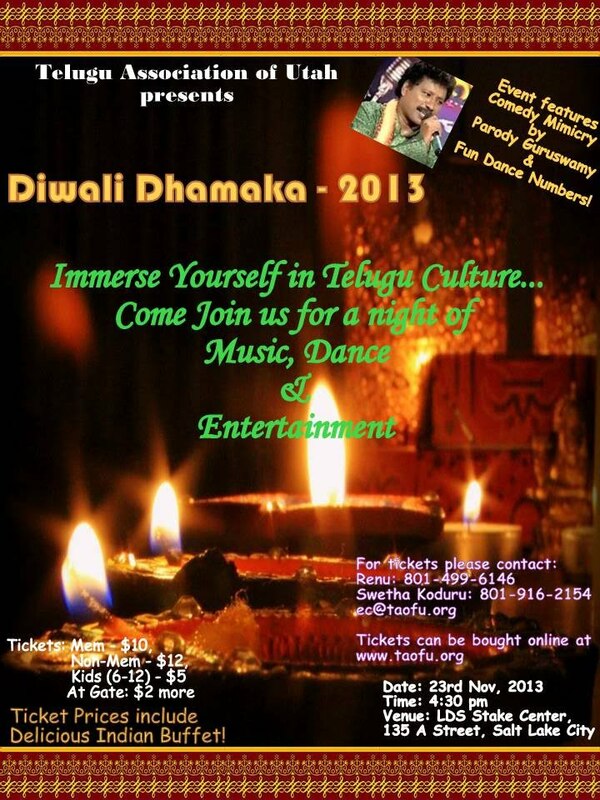 "Diwali Celebrations - November 23rd 2013"
Any other talent that can be performed on stage. We recommend group performances for kids (3 or more in a group). All the interested participants are requested to provide the following detail. Participation Type (Solo/Group) - if Group, how many? We request the interested participants to email us before Nov 10th, 2013 to culturalcommittee@taofu.org. Performers will need to go through a short informal audition. On 11/09/2013, 350 Chicken Burritos were prepared and served to the homeless at Dinner at Vinny's 437 W 200 S Salt Lake City. The event was hosted by Ganga & Krishnakanth Golakoti. On 10/19/2013, 360 Veggie Burritos were prepared and were served to the homeless at Dinner at Vinny's 437 W 200 S Salt Lake City. The event was hosted by Jyothi & Dr. Bhavananda Reddy. On 09/07/2013, 360 Veggie Burritos were prepared and were served to the homeless at Dinner at Vinny's 437 W 200 S Salt Lake City. The event was hosted by Rohini & Amarendra Vinnakota. On 08/10/2013, 360 Chicken Burritos were prepared and were served to the homeless at Dinner at Vinny's 437 W 200 S Salt Lake City. 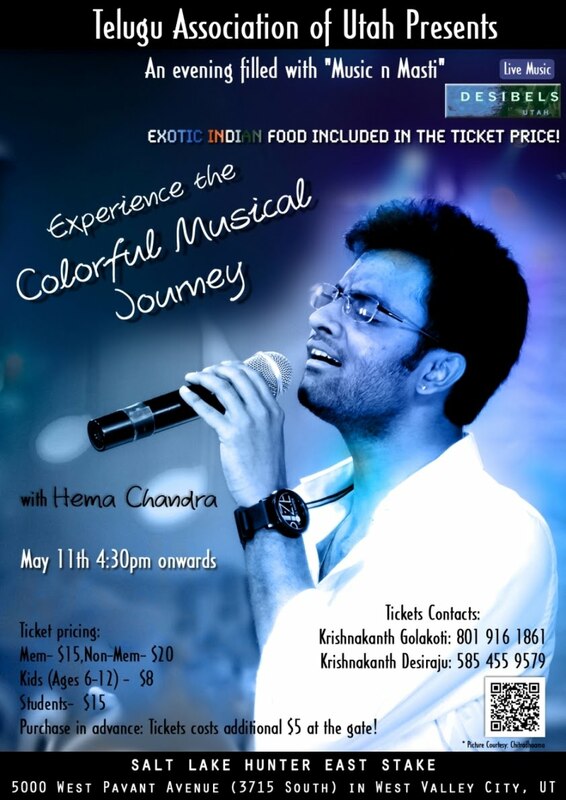 The event was hosted by Ganesh Indian Cuisine restaurant. Following an exciting, nail biting finals on 08/08/2013, the winners of the 2013 TAU Volleyball tournament are SMASHERS. This year there was Intermediate Zone finals as well, and Rebel Stars are the winners of the Intermediate Zone finals. TAU congratulates players and supporters/fans of both the teams. TAU would like to thank you for your participation in TAU Volleyball/TAU Sports 2013. TAU commends each and every captain/volunteer/umpire for their support and willingness to help in conducting this successful tournament. See you all next year for another exciting season of Volleyball 2014. Until then, have a great rest of the summer. On 05/18/2013, 360 Veggie Burritos were prepared and were served to the homeless at Dinner at Vinny's 437 W 200 S Salt Lake City. The event was hosted by Ganga & Krishnakanth Golakoti. 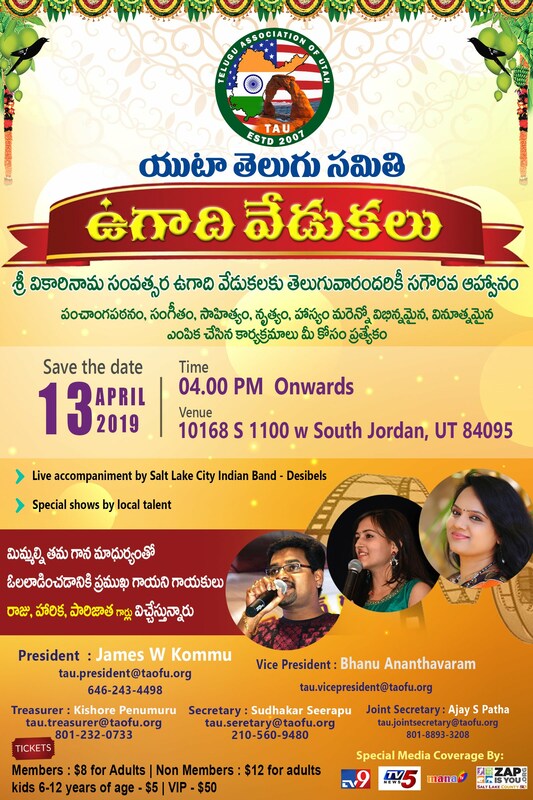 Telugu Association of Utah conducted the cultural program - an evening filled with music "Music & Masti" with dynamic and vibrant playback singer "Hema Chandra" on Saturday, May 11th at Salt Lake Hunter East Stake, 5000 W Pavant Ave, West Valley City. On 04/13/2013, 380 Veggie Burritos were prepared and were served at Salvation Army. The event was hosted by Renu & Guru Bandiatmakur. On 03/09/2013, 360 Veggie Burritos were prepared and were served at Salvation Army. The event was hosted by Swetha & Kiran Koduru. On 02/09/2013, 350 Veggie Burritos were prepared and were served at Salvation Army. The event was hosted by Kalyani & Balaji Pinjala. A total of 12 adults and 6 children helped prepare the burritos. Annadaanam (Food cooking and serve) under was conducted on 01/12/2013. 350 vegetable burritos were prepared and served. 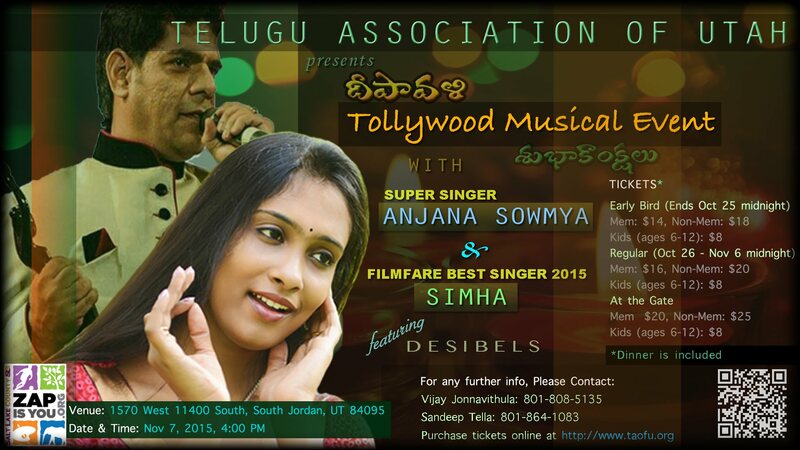 Telugu association of Utah thanks the following people of their contributions. Telugu Association of Utah welcomes the new 2013 Board. Please continue your support to the 2013 Board. 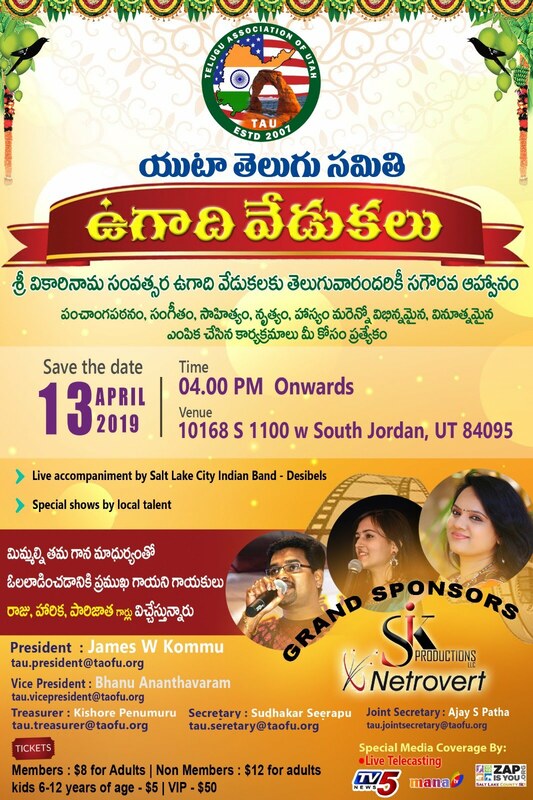 Telugu Association of Utah announces the 2012 General Body Meeting. "Annadaanam" (food cooking and serving the needy) was conducted on 12/08/2012 at Sudha and Balaji Varanasi's place. 330 vegetable burritos were prepared and served at the Salvation Army. "Annadaanam" (food cooking and serving the needy) was conducted on 11/10/2012 at SAI Kuteer. 350 vegetable burritos were prepared and served at the Salvation Army. "Annadaanam" (food cooking and serving the needy) was conducted on 10/13/2012 at Jyothi and Bhavanand Reddy's place. 330 vegetable burritos were prepared and served at the Salvation Army. Here is the volunteers list who helped. "Annadaanam" (food cooking and serving the needy) was conducted on 09/15/2012 at Swetha and Kiran Koduru's place. 330 vegetable burritos were prepared and served at the Salvation Army. Grab a blanket, some popcorn, and your best pals for an outdoor movie party! If you're feeling nostalgic for the big screen excitement of a drive-in theater, a backyard movie night,so block your calendar with "TAU Summer Night Extravaganza-2012"
Imagine playing games (for all ages) followed by food and movie under the stars! And ever wondered when the video calling, video chat ever started?? Well, this movie is going to give you the answer for it. All time legendary movie entertainer for all the age groups "MayaBazar" (in color Bluray). Watch it on the big screen in the park. So why late send your RVSP at the earliest to help us plan better. Food: Indian food, pizzas for Kids and water supplied by TAU. Entry Fee: Free for members and Kids and $3 for non-members. Note: Don't forget to bring your blankets or chairs and pop-corn. 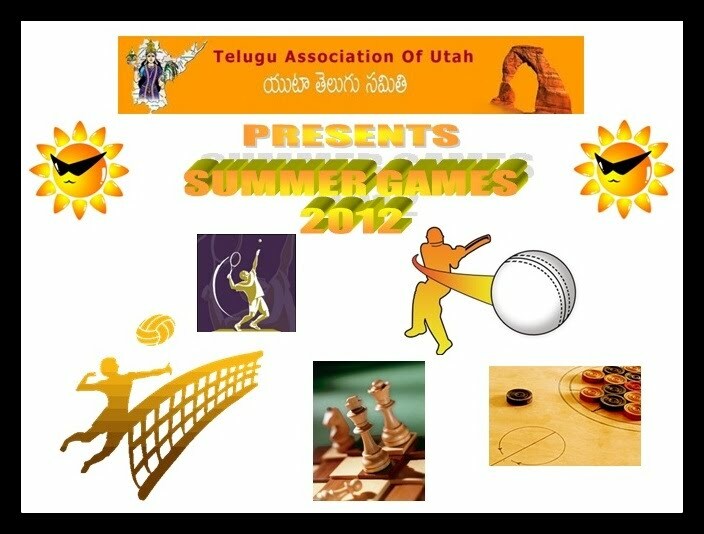 "TAU Summer Games 2012” are being conducted as a Fundraiser for “Utah Indians Emergency Fund” that Telugu Association of Utah would be undertaking. TAU Cricket - 2012 Winner's "SPARTANS"
TAU Cricket - 2012 Winner's "SLC Smashers"